… others remain, chief among which is the unprecedented divergence between stocks and bonds, as markets increasingly price in QE4 . What is the “tale of the tape”? Where are the “green shoots”? What’s the most vulnerable crowded trade? Why are bond yields stubbornly low? 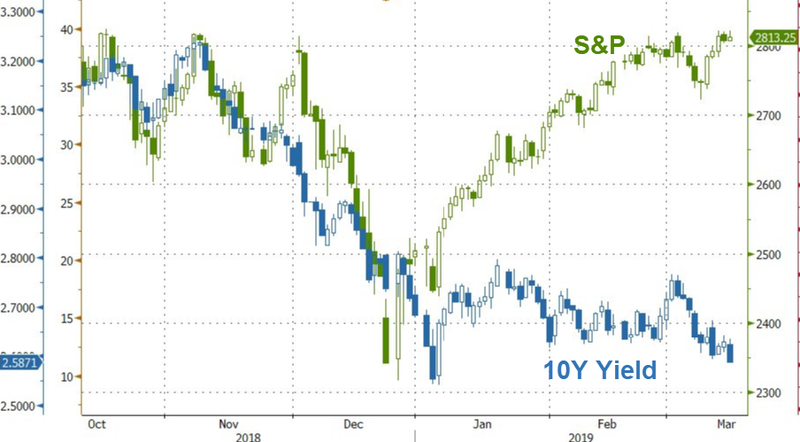 … and answers it simply: the “pain trade” is still up for one main reason: with new highs in IG & HY bond prices, new lows in volatility (the record drop in the MOVE index), all this shows that central banks are “all-in”, even though markets are not yet willing to trade the “policy impotence”. Some other tape revelations: even as cyclical lead indicators remains mixed: e.g. XBD, XHB, SOX, KOSPI/ChiNEXT treading water on weak macro; global banks are close to new ’19 highs. Meanwhile emerging markets are showing cracks: China & India aside, “short US$, long EM” consensus under pressure, while at the same time the rally is reversing in “high-yielding” EM FX (PHP, IDR, BRL, ZAR, TRY). Looking at the big picture, there are no “green shoots” to be found with BofA’s global EPS model forecast now plunging from -2% to -10% on “dire Asian exports & global PMI deterioration” in February; this is a far cry from the analyst consensus of 1% EPS growth in 2019. Meanwhile, as we discussed recently, both the Japan and Eurozone economies remain in recession although the silver lining is that BofA’s European Composite Macro Indicator has finally stabilized after 12 consecutive months of decline. Meanwhile, there are plenty of “green shoots” in China, where both M1 & new orders rose in Feb for 1st time in 9 months, March (first 20 days) exports up 39% & electricity usage +11%; The cherry on top: Jan-Feb investment at state-owned enterprises rose 6%, first big increase in 2 years. Putting all this together, Hartnett reaches the same conclusion as Morgan Stanley, namely that Q1 is the low for global macro data, while downside risk for growth is more likely from US where consensus sees Q2 GDP bounce to 3% from 1% in Q1. This is also the bogey: should Q2 EPS come in <2%, the risk rally would end. Yet even the US has some good news, namely US survey data which stabilized in Feb and is correlated and consistent with at least 2-3% US growth. While we answered this question previously, it is gratifying to see that BofA reaches the same conclusion as us. 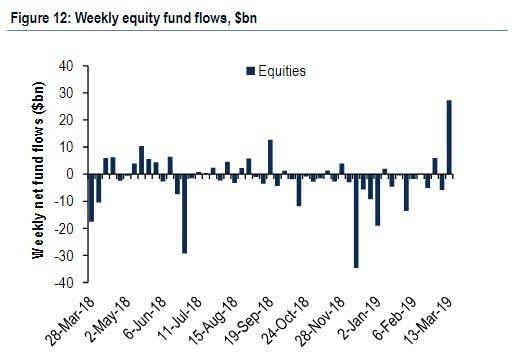 The bank frames the problem as follows: global stocks are up 11% YTD despite $46BN of equity outflows YTD and the BofAML Fund Manager Survey showing drop in asset allocation to global stocks. Retail investors via single stocks: $13.2bn buying YTD from BofAML GWIM data (vs. $5.7bn selling same period last year). If that is not enough, here is a second answer: when the combo of higher US unemployment claims & higher credit spreads indicate the onset of recession & debt deflation; or when combo of higher Treasury yields & lower US dollar indicate inflation & Fed policy mistake. Here the answer is simple: emerging market debt and equity: in the February edition of the BofA Fund Manager Survey, the most crowded trade was “long EM”; since it was released, the price return of EM debt 0.4%, of EM equity 0.3%. And in case that point needs to be underscored, Hartnett notes that “historic returns from month of “most crowded trade” poor, e.g. FAANG+BAT stocks after Aug’18, Bitcoin after Dec’17, US dollar after Jan’17. Those traders who correctly figure out how to trade this massive disconnect – the structural deflation as hinted by bonds on one hand, and asset price inflation as stocks scream every day – will make a lot of money in 2019.